Walk uprightly with conviction and clarity. “Daniel purposed in his heart that he would not defile himself.” Daniel 1:8 NKJV. I am assuming you have read my most recent comments on, “Clarity or Ambiguity.” If not, take a few minutes to do so at: allenrandolph.com. I would like to continue a bit on this important theme – the necessity of purity as the basis for moral and spiritual clarity. In a confused, uncertain, and less than clear world, clarity is a rare but valuable commodity. Too many people live in a relational, moral, and spiritual fog. Not much seems clear about matters that are vital. Our culture, media, and popular opinions offer mixed assumptions and confusing answers, of which Jesus warned, “Can the blind lead the blind? Will they not both fall into the ditch?” Read Luke 6:39-42 NKJV. The answer is obvious; the results are debilitating. Without purity life is confusing. Too many people are sorely burdened by their past and woefully uninformed and unprepared for eternity. Too many marriages and families struggle without enduring truth as their foundation. As a result, far too many marriages stumble forward with increasing dismay and the resulting disarray. Making sense of daily life and finding purpose and meaning require God’s truth, not man’s opinions. God’s Word provides the answers you lack and the wisdom you need. Jesus taught eight simple, practical principles for a life that God promises to bless. 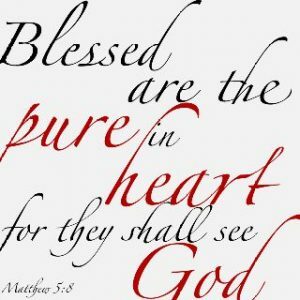 Among those, Jesus affirmed that, “Blessed are the pure in heart for they shall see God.” Matthew 5:8 NIV. Do you see the connection? Purity is necessary for spiritual clarity. I am inspired by the clarity of Daniel’s conviction. In a hostile culture and with every pressure to conform,“Daniel purposed in his heart that he would not defile himself.” Daniel 1:8 NKJV. As Daniel did, set the Word of God as foremost in your heart and daily practice. Walk uprightly with conviction and clarity. Jesus directly connected the purity of your heart with your ability to recognize truth and comprehend God. “Above all else, guard your heart, for it is the wellspring of life.” Proverbs 4:23 NIV. The principle applies broadly. The more your heart is cleansed by God’s Word, the clearer your understanding and the more consistent your obedience. The Psalmist wrote, “The law of the Lord is perfect, converting the soul . . The commandment of the Lord is pure, enlightening the eyes.” Read Psalm 19:7-10 NKJV. Jesus often used stories, examples, or analogies to present a practical truth. On one such occasion, He asked, “Why worry about a speck in your friend’s eye when you have a log in your own? . . First get rid of the log from your own eye; then perhaps you will see well enough to deal with the speck in your friend’s eye.” Read Matthew 7:3-5 NIV. Clarity about Who God is, what His Word says, and who you are in Christ are essential and invaluable. But from where does such clarity come? “The good man brings good things out of the good stored up in his heart, and the evil man brings evil things out of the evil stored up in his heart. For out of the overflow of his heart his mouth speaks.” Luke 6:45 NIV. Writing to Timothy, his young protégé, Paul summarized God’s calling and expectation, “Set an example for the believers in speech, in life, in love, in faith and in purity.” 1 Timothy 4:12 NIV. That’s a big order, but not too big for the Holy Spirit to reproduce in you. Read Galatians 5:22-23 NLT. Today, I pray for you to be sure about the things that need to be clear. Satisfaction is measured by accomplishment not reward. “I pray that you may prosper in all things and be in health, just as your soul prospers.” 3 John 2 NKJV. God created you to succeed. And that should be your goal. A desire to succeed is common to the human heart. No one makes plans to fail but many fail to plan. But first, you need to know how you define success? Without that, how do you even measure success? It is important that you determine your personal definition of success and that should be founded on God’s Word. If you don’t have benchmarks for measuring achievement, how will you know when you accomplish it, or recognize when you fail to do so? It is tragic to allow other people’s opinions to dictate what true success should be for you. You will invest a lifetime of effort and energy to achieve fulfillment and meaning. A good question to ask yourself is, “When I get where I’m going and have what I’m wanting, where will I be and what will I have?” Too many people end up with full pockets but have an empty heart. 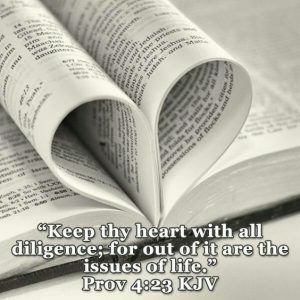 Solomon offered sage advice, “Keep your heart with all diligence, for out of it spring the issues of life.” Proverbs 4:23 NKJV. Success with satisfaction begins in your heart. Will wealth and possessions be your proof of success? The applause or acclaim of others? Some time ago, I saw a bumper sticker that said. “At the end, the one with the most toys wins!” But do they? True success must be so much more than having the biggest pile of unnecessary stuff. God’s Word says, “Each one should be careful how he builds. If any man builds on this foundation using gold, silver, costly stones, wood, hay or straw, his work will be shown for what it is. The fire will test the quality of each man’s work.” Read 1 Corinthians 3:10-15 NIV. Eternal values differ immensely from what the world values. I think that satisfaction, and contentment with what you achieve, is a more reliable measurement of success than the weight of public opinion or the tangible and external rewards of one’s accomplishments. Success without satisfaction is a myth. Where you find your supreme fulfillment is where you will find your greater success. “[Blessed is the man who is] like a tree planted by streams of water, which yields its fruit in season and whose leaf does not wither. Whatever he does prospers.” Read Psalm 1:1-3 NIV. What a great promise! For me, the arenas where I intend to succeed, find satisfaction, and most prize any success are in the opportunities and responsibilities of family, friends, and ministry. As regards Family, I will evaluate success by the Godly fruit to be found in our children and grandchildren, and the generations who will follow them. I will measure the faith and values we hold in common, the times we love and enjoy one another’s company, and our family’s continued love and service for the Lord. However anyone else chooses to evaluate my success, our family is central to my definition of success or disappointment. As regards friends, life is richer because of the example, encouragement, and fellowship of friends who share life and faith with you. Life can be lonely, even unfulfilling without people who gladly share your joys and sorrows. As regards ministry, I choose to evaluate success based on obedience and faithfulness to God’s call and meaningful service to God’s people. I am grateful for whatever measure of outward success that we have experienced these fifty plus years of pastoral ministry, but in my heart, I know that whatever success might be attributed to us, God’s grace and people’s graciousness have been its true source. So, I will thank God, my family, and friends, and celebrate every year of blessing and privilege extended to us. “Therefore, as we have opportunity, let us do good to all people, especially to those who belong to the family of believers.” Read Galatians 6:8-10 NIV. My prayer for you encompasses all you are and all you do. Today, I pray for you to not waste time on empty dreams but instead pursue God’s will. “ For what I do is not the good I want to do; no, the evil I do not want to do – this I keep on doing” Romans 7:19 NIV. Keep your convictions clear and your contradictions few. “To thine own self be true and it must follow, as the night the day, thou canst not then be false to any man.” William Shakespeare. Musically, the effect of incongruity is dissonance. Relationally, the result is discord. Spiritually, the consequence is disunity. When behavior contradicts professed belief, your integrity and reputation are diminished. From my Dad I learned, “A man is only as good as his word.” James, the brother of Jesus, made it simple and clear. “Let your yes be yes and your no be no.” James 5:12 NIV. James’ instruction is about far more than vocabulary. James’ words are about living with clarity, consistency, and integrity. Always do more than you promise, never less. Be true. Be real. Be consistent. Never allow your life to contradict your values. As a young minister, I was challenged by a probing question that Jesus asked. “Why do you call me, ‘Lord, Lord,’ and do not do what I say?” Luke 6:46 NIV. That is a glaring inconsistency to which all of us have to plead guilty on occasion. Jesus then told a story contrasting a man who built his house on solid rock and another who was content to build his house on shifting sand. Which do you think succeeded? Read Luke 6:47-49 NIV. Whatever its momentary circumstance, the safest place in the world is in the center of God’s will. Your future rests securely on that which will neither change nor fail – the Word and will of God. Jesus told another story about two sons. One promised something to his father, but never did what he said. His action was inconsistent with his words. The other at first refused but later complied. Read Matthew 21:28-31 NIV. Which did the will of his father? Perform above your promise; God does. Paul identified our common dilemma but also pointed us to the only One who gives us success and victory. “I do not understand what I do . . For I have the desire to do what is good, but I cannot carry it out. For what I do is not the good I want to do; no, the evil I do not want to do – this I keep on doing. Now if I do what I do not want to do, it is no longer I who do it, but it is [a sin nature] living in me that does it. So I find this law at work: When I want to do good, evil is right there with me . . What a wretched man I am! Who will rescue me from this body of death?” Then, Paul shares the only answer to his victory and ours. “Thanks be to God – through Jesus Christ our Lord!” Read Romans 7:15-25 NIV. James wrote of this same spiritual/carnal contradiction, “With the tongue we praise our Lord and Father, and with it we curse men, who have been made in God’s likeness. Out of the same mouth come praise and cursing. My brothers, this should not be. Can both fresh water and salt water flow from the same spring? James 3:9-11 NIV. The inconsistency is consistent! “The good man brings good things out of the good stored up in his heart, and the evil man brings evil things out of the evil stored up in his heart. For out of the overflow of his heart his mouth speaks.” Read Luke 6:43-45 NIV. “Above all else, guard your heart, for it affects everything you do.” Proverbs 4:23 NLT. That is achieved only by allowing the Word of God to dwell within you. “Let the word of Christ dwell in you richly as you teach and admonish one another with all wisdom.” Colossians 3:16 NIV. If God is Sovereign – and He is – His Word is absolute and His will is final. “I have hidden Your Word in my heart that I might not sin against you.” Psalm 119:11 NIV. My desire and intent is to never allow my life or words to contradict the faith I profess and the Word of God I preach. Today, I pray for you to walk before God and man with integrity and authenticity. “You are My Son, whom I love; with You I am well pleased.” Mark 1:11 NIV. Inner tension results when the image you project is not the identity you possess. People often confuse image and identity; they may seem similar but are distinctly different. The first is an inadequate imitation of the latter. Image is what you project to others, what you prefer others believe about you. Identity is who and what you really are. Emotional and spiritual tension results when the image you project is not the identity you possess. Any disconnect between image and identity creates confusion and dissimulation. It is significant that at Jesus’ baptism before His public ministry began, the Father affirmed Jesus’ eternal identity. An audible voice from Heaven was heard, “You are My Son, whom I love; with You I am well pleased.” Mark 1:9-11 NIV. Imagine the strength of the Father’s testimony when others would later dispute His identity and deny His authority. Image confines you to less than you are; identity frees you to be all God intends. Sin and self conspire to substitute image for identity. They are not interchangeable to God. Jesus evidenced the freedom of identity and humility when He washed the feet of the disciples. John 13:1-17 NKJV. In four statements, John defines Jesus’ identity and the secret of His humility. (1) Sure Knowledge. “Jesus knowing . .” Jesus had unshakable conviction of unchanging truth. When you know Who God is, you believe what God says. (2) Sufficient Resource. “. . knowing that the Father had given all things into His hands,” When you do God’s will, you will have all you need to succeed. (3) Sacred Origin. “. . knowing that He had come from God,” When you know where you came from, you can always find your way home. (4) Secure Destiny. “. . knowing He was going to God.” Your destiny in Christ is irrevocable. Read John 14:1-3 NIV. When your future is sure you are freed to live life fully now. As was the Jewish custom, a basin of water and towel were at the door when the disciples gathered for the Passover. Apparently, not one of them considered the basin and towel were there for their use. As Jesus began washing the disciples’ feet, Peter remonstrated against Jesus washing his feet. Was his refusal from pride or shame? 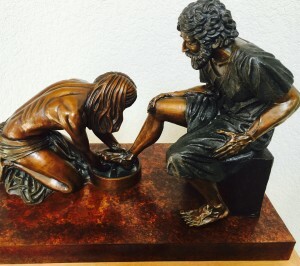 Peter, like the others, never thought to wash the Messiah’s feet, let alone the feet of his fellow disciples. Peter’s image of himself and his image of Jesus were radically less than the identity out of which Jesus ministered. “Jesus rose from supper and laid aside His garments, and took a towel and girded Himself . . to wash the Disciples’ feet.” Read Philippians 2:2-11 NIV. Humility is the byproduct of a Godly identity. 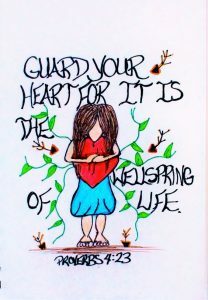 Solomon’s wise counsel is this, “Above all else, guard your heart, for it is the wellspring of life.” Proverbs 4:23 NIV. Today, I pray that you will not settle for anything less than God created you to be.